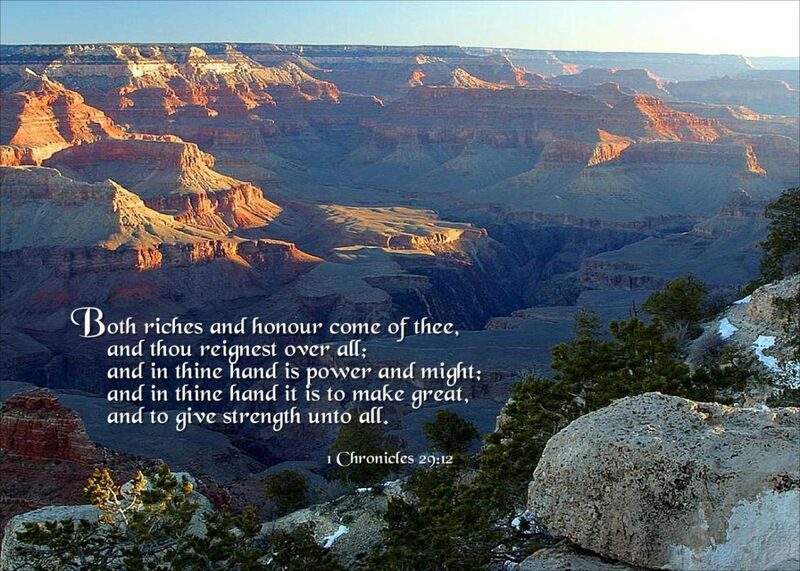 Riches and honor come from Me, says the Lord. I Am the greatness, the power and the glory. For all that is in heaven and on earth belongs to Me. Victory and Majesty are Mine. I Am exalted as head above all, and in My hand is power and might. I Am on your side to not only defend you, but to bless you with all that is within My kingdom. I give strength to all who belong to Me, and all good things come from Me, says the Lord. Come before Me with praise and thanksgiving, for it is My good pleasure to give unto you My kingdom and all the entitlement that comes from being My child. You have been adopted into My family as you received Me as your Savior and Lord. All that I have I give freely to you. Just believe and receive all the benefits that I daily load you with. Trust in My love, My power and My presence in your life. No good thing will I withhold from those who love Me and receive what I freely give that I purchased by My shed blood and finished work on the cross, says the Lord. Come up higher and be loosed from the earthly mentality and take on the title of a king and a priest onto Me. Do not limit yourself to what you see and hear and understand and feel. Come higher and receive sight of that which is above and beyond that which your mind can grasp. There is no end to My kingdom, My power and My glory, says the Lord. There is no end to My substance. My supply and resources are not limited. My supply is inexhaustible. Whatever you need, whatever you desire is furnished for you through your faith and trust in Me. Hold fast to your confidence in Me and hold fast to your New undefeatable nature. Do not give into the inferior things of this earth and set your goals at achieving the possible. That is far too small and inferior to My superior thoughts and ways. Use your faith. Nothing that you can achieve takes bold faith. So go for the impossible and Make that your goal in Me, and watch Me DO the impossible. WATCH ME WORK the miracles. Since when do I have to explain Myself to anyone? You don’t have to know how I can. Believe that I will! You don’t have to see or hear or understand or know My ways. You are called to faith and trust in ME, and to know that I Am good for whatever you need and desire. I perform the supernatural and invade impossibilities all the time to manifest My power. Do you believe to receive or will you only settle for the lesser earthly attainable goals that you set. See through My eyes and hear through My ears and Know through Me what your eyes have not seen, your ears have not heard and your mind could not think or imagine what I have in store for those who love Me and trust in ME. Are you ready for the GREAT I AM? I Am your God, and I Am inviting you to come up higher and receive the unthinkable and unimaginable in ME, says the Lord.